I am afraid that I can no longer suppress my strong feelings about granite. Why in God’s name does everyone use this as a kitchen surface? I hadn’t had any experience with granite until we moved into our rented condo last year. We had black granite tile on the counter surfaces. It was impossible to clean and showed every streak, drip, or speck of dust. And, tile as a kitchen surface??? What were they thinking — every grout line becomes a sinkhole for detritus!?! Here in our temporary rental apartment in Buenos Aires, we have a solid slab of granite in the pattern shown above. This counter is still impossible to keep clean, and with the busy pattern, it’s infeasible to determine if it is wet or dry, sullied or unsullied, etc. And, in relation to our aforementioned recurring ant problem, we can’t spot those little bastards on the counter to save our life. The buggers basically need to be engaged in the equivalent of a manifest destiny ant migration before we can locate them for the paper towel kill. 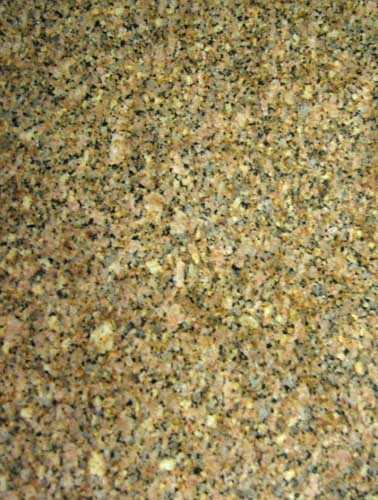 I hate granite. 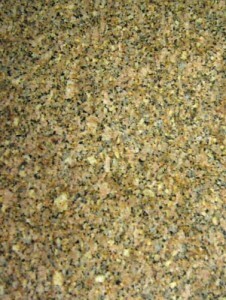 I’ll stick with boring old Formica (it will become retro chic any day now). This entry was posted on Wednesday, November 5th, 2008 at 4:24 pm. You can follow any responses to this entry through the RSS 2.0 feed. You can leave a response, or trackback from your own site. we have 0 wine glasses left in our house. all succumbed to granite-related casualties.